In all, Russia plans to have 26 nuclear power plant units by 2030, seven of them of which are already under construction. The construction of the Baltic nuclear power plant in Neman district (10 km from the border of Latvia) began in 2010. The construction is carried out by the company Rosenergoatom. The project, managed by State Corporation Rosatom and a planned 49% of private investment, includes two power-generating units with power of 1170 MW and a lifetime of 50 years of each. Most of the electricity produced in the Baltic NPP is intended for export outside the Kaliningrad region to EU countries. The agreement on building the nuclear power plant was signed on the 16th of April 2008.
by hiding potential risks. The problem of the disposal of the radioactive waste to the Russian Federation is also a concern (as it may have to pass through Lithuania). According to the EIA, the estimated radius of the zone planning for a mandatory evacuation of the population in a severe accident does not exceed 800 m. Environmentalists dispute this. There is also serious protest by Lithuania due to the dangerous proximity of the NPP to the borders. According to the Lithuanian Ministry of Foreign Affairs, Russia has failed to explain why the power plant was to be built so close to the border and to carry out seismic analysis; the environmental impact assessment was based on old sources while an earthquake recorded in 2004 was stronger than previously anticipated; Moscow has also failed to explain how it is going to cool the reactor, how it will affect the river Nemunas and surrounding territories; it has not provided a detailed emergency plan and has not carried out stress testing. The transport of spent fuel through Lithuania is also a serious concern (1). Public hearings in Sovetsk were planned on August 19th, but were canceled. The initiative group against the construction of the Baltic NPP believes the cancellation was caused due to citizen opposition to the project. On the 17th of July 2009 a rally of supporters of Baltic NPP, organized by the United Russia party took place in Neman. Journalists argue that people were forced to come to the rally. 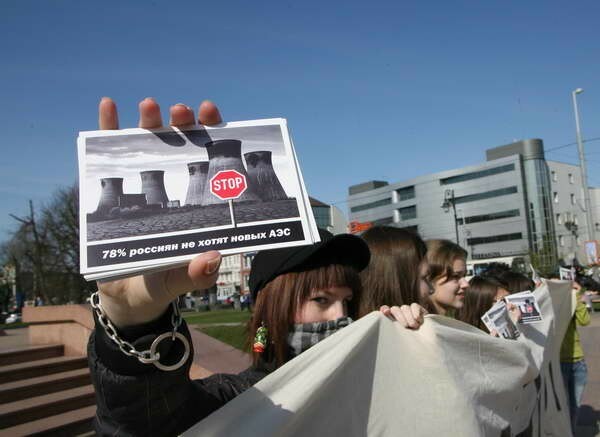 More than 500 citizens took part in a protest in the city Sovetsk (Kaliningrad region) on the 11th of September 2011, they also signed an official letter to the President of the Russian Federation requesting cancellation of the nuclear power plant construction. A protest against financing of the construction of the Baltic NPP by the French banking group “Societe Generale” also took place in the center of Kaliningrad. There was also canvassing for a referendum on Constructio Baltic NPP in social networks. Deputies of the Kaliningrad Regional Duma refused activists of the initiative group in a referendum on the construction of the NPP. The protests were not taken into account and gradually ended. Construction on the project was suspended in 2013 after the Baltic states and the European Union decided last year to sever their electricity grids from that of northwestern Russia. Russia has thus decided to revise the project due to the need to find proper transmission links, as well as investors to supply funds and export routes. According to Rosatom, the revised draft will be approved in 2014. Project Details The Baltic Power Plant consists of two VVER-1200 (two-circuit water-water) reactors (водо-водяной энергетический реактор) that were initially developed to power nuclear submarines. The first ever reactor of this type will only be turned on next year in Novovoronezh Nuclear Power Plant. Each Baltic NPP reactor will have the capacity of 1,150 megawatts and should be turned on in 2016 and 2018. The turbines will be French-made Arabelle. The envisaged life-span of the power plant is 50 years. Worley Parsons was appointed technical consultant for the project. The joint venture Alstom-Atomenergomash (AAEM), established in 2007 between Alstom and OAO Atomenergomash, part of Russia’s state-owned Rosatom Group, was suspected to build the turbine island for the nuclear power plant. AAEM is the supplier and installer of the major equipment of the turbine island, including Alstom’s ARABELLE steam turbines, generators, condensers, moisture separator reheaters, low-pressure and high-pressure feed water heaters, feed water tanks and various other auxiliary equipment. Environmental justice organisations and other supporters Initiative group "Ekozaschita"
Why? Explain briefly. The protests were ignored; no further protest activities were done. Construction began before meaningful consultations were carried out locally or with neighbouring Lithuania. Article "Nuclear Power in Russia"
Video for the referendum with the slogan "We live! We decide"